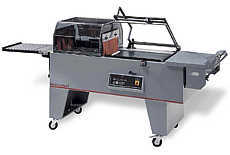 For medium throughput requirement, the Opti® 3000 is the ideal system. The Opti® 3000 Shrink Packaging System can package up to 12 packs per minute in an integrated wrapper tunnel design. The Opti® 3000 is equipped with an "intelligent" ondemand tunnel that only activates as products enter, resulting in significant energy savings. The nine dot logo and OPTI® are trademarks or registered trademarks of Sealed Air Corporation (US). Seal dimensions 16.54" x 21.65"